When I start to talk about home delivery, immediately, pizza or fast food rings a bell. But a certain start-up is delivering (home delivery) a different type of food, with fewer calories too, to homes. Fresh in a box is a new start-up that has lately excited the hearts of many with its home delivery of vegetables. Just as easy as how you order your pizza is how you order vegetables with Fresh in a box. Fresh in a box success, thus far, is disproportionately owed to its use of simple technology, fresh-out-of-the-field vegetables and its competitively low prices. The Fresh in a box team visits farms, gardens, plots etc. and collect the best and ‘freshest’ of produce for its customers. 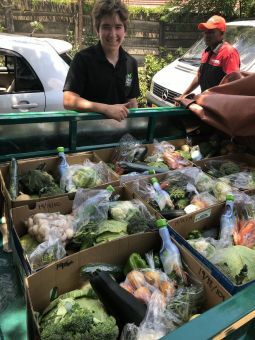 By going to farms, gardens, plots etc., thus cutting off the ‘middleman’, Fresh in a box is able to secure produce at low prices and in turn, sell it at lower prices than prices you find at Food Lovers or at Mbare Musika (according to Kuda Musasiwa, Fresh in a Box’s Vendor in Chief). How’s Fresh in a box doing it? Fresh in a box is using one of the simplest, but apparently, effective technology, to conduct its business. Rather than creating a completely new app it is using WhatsApp for the whole process of ordering your vegetables and communicating too. You know how well WhatsApp is used in Zimbabwe due to how relatively cheap it is. In respect of this, Fresh in box decision of leveraging WhatsApp is a masterstroke because anyone can order their vegetables without having to go through the costly pains of buying extra data (for a different app). Beyond its WhatsApp’s use, Fresh in a box also has leveraged the subtle power of Twitter to market itself and interact with its clientele. Like I said ordering with Fresh in a box is quite easy. You just have to save Fresh in a box’s number, which is 0774 162 442, and text them, Hi, on WhatsApp. Since Fresh in a box is using a WhatsApp bot, you will be replied instantaneously and it will send you the steps to make your order. After you make your payment to their merchant number, you then send them the confirmation code on WhatsApp. Fresh in a box will then ask you to send them your location. Your Fresh in a box order will be completed after these steps. Besides ordering through WhatsApp, you can also make your order through Fresh in a box’s very-simple to-use website (https://freshinabox.co.zw). I love their website, it’s so simple and direct and it has no clutter. How long does Fresh in a box take to home-deliver your order you might ask? According to its Vendor in Chief, Kuda Musasiwa he said it depends with your location, some get their order in just a few minutes, some in a few hours and some in the day after (that is if you order at the end of the day), although it happens sporadically. Although still young, Fresh in a box has already made, what I can guardedly say is, a strategic partnership with Hwindi Taxi. Hwindi Taxi is one of the pioneers in the ride-hailing space in Zimbabwe. 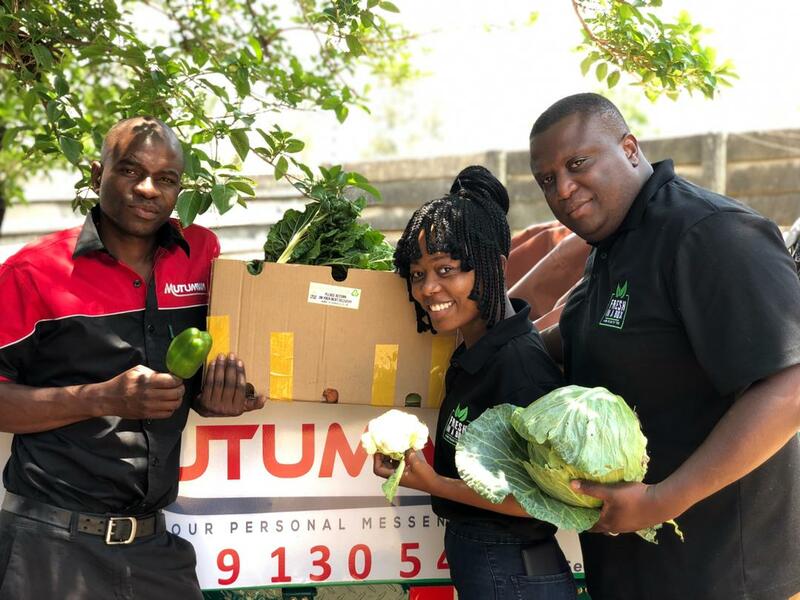 According to Kuda Musasiwa, Hwindi sometimes helps Fresh in a box with its delivery when its overwhelmed with delivery orders. In other words, Fresh in a box outsources to Hwindi Taxi. Since Hwindi is seasoned in transportation (it brings its logistics know-how) and logistics is key for Fresh in its business model, it makes sense for them to work together. 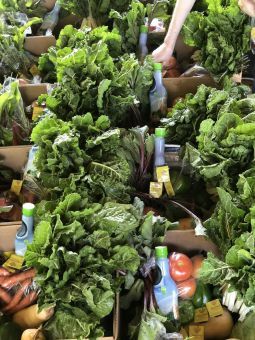 How much is Fresh in a box’s vegetables and home delivery? As its name implies, the vegetables literally come fresh whilst in a box. Depending on your order, the prices of the vegetables range from $20 to $60. The prices are quoted in bond notes or mobile money (EcoCash or One Money). The delivery cost is included in the price so don’t worry, you won’t fork out extra money to pay for delivery. After seeing the quality and amount of vegetables, Fresh in a box sales, we, as Techzim, have decided to order one box for ourselves. After the delivery of order, we will tell you more about Fresh in a box. At $20/box, many people have to combine to buy a box and failure to deliver same day is not excusable. Otherwise, a very grand idea. Keep improving. Is this a startup or a business? What’s the definition of a startup? Asking for a friend. Grand concept though. Fresh in a box is the middle-man. I don’t see how a middle man has been cut off? Unless I’m missing something?? Wow! What a great idea. I actually messaged them on Monday morning and had it delivered on the same day. It is a bit pricey though, maybe a box for $10? Checkout the mentioned vendor in chiefs Twitter, he’s often active.